FREMANTLE midfielder Ryan Crowley has been issued a show-cause notice and is serving a provisional suspension after testing positive to a banned substance on a match-day last season. Crowley is awaiting a hearing to appear at the AFL Tribunal after testing positive to the substance, which was contained in a painkiller that the Dockers said they had not prescribed. CEO Steve Rosich said the 31-year-old was acting outside the club's normal process by taking the painkiller. Crowley's positive sample was taken after Fremantle's round 17 clash against Greater Western Sydney on July 13. According to a timeline released by the AFL, that sample wasn't tested until August 11. Crowley was notified of a positive 'A' sample result for a 'specified' substance on August 18. His 'B' sample was tested on September 11 and he received a show-cause notice on September 18 - five days after Fremantle's last game of the 2014 season. Under the AFL Anti-Doping Code, a player who tests positive to a specified substance may, if they choose, continue to play and train as normal until the result of an Anti-Doping Tribunal. Crowley kept playing until the end of the season and accepted a provisional suspension, which started on September 25 last year. The testing of Crowley's 'B' sample was the reason for the delay in issuing the infraction. Crowley himself wasn't formally notified he had tested positive until September, after the Dockers' season had ended at the hands of Port Adelaide. Rosich said the AFL first informed him that there was an issue with Crowley's sample in late August. Fremantle's risk integrity committee, which includes Dockers president Steve Harris, was informed of the issue on September 25 but Crowley's identity was not revealed until last week. "I knew the player's name when I was first contacted by the AFL," Rosich said. "The risk committee was made aware of the matter, including Steve Harris, who sits on that committee, on the 25th of September, but not the player's name. "The risk committee was only made aware of the player's identity last week and the full board fully informed of the matter, including the player's name, this morning." The Fremantle player leadership group was informed on Monday morning and Rosich said the full playing group would be addressed upon their return to the club on Tuesday. Rosich said Crowley would likely address the playing group himself. The 2012 club champion has appointed independent legal advisers and is cooperating fully with the AFL and ASADA, according to the Dockers. Crowley, who had mysteriously been ruled out of selection by coach Ross Lyon last week, read a statement at a press conference on Monday afternoon. "I would like to thank my partner Samara, my family and the club for their support over the past few months. It has been invaluable," Crowley said. "I have my own legal advisers working on the matter and they have also been a great support. "I will continue to fully cooperate on this matter with ASADA and the AFL. At this stage, I’m looking forward to the AFL Tribunal hearing taking place." Rosich said Crowley would meet the full costs of his legal defence and the club would merely have a supportive presence at the hearing when it takes place. Fremantle president Steve Harris said the club had not commented on Crowley's ban because of confidentiality clauses in the AFL Anti-Doping Code. "We are keen for the matter to go to the AFL Tribunal but determining a date for a hearing is out of the club’s control," Harris said on the club's website. "We have a continuing and ongoing duty of care for Ryan, both personally and professionally. "Ryan’s ongoing health and capacity to cope with this matter have been key areas of focus for the support we have been providing him with." AFL general counsel Andrew Dillon said on Monday the League had issued an infraction notice against Crowley under its Anti-Doping Code. The AFL Anti-Doping Tribunal would meet at a date yet to be fixed, Dillon confirmed. Ahmed Saad (St Kilda): Suspended for 18 months in November 2013 for after testing positive in July for a banned substance, believed to be a stimulant in a sports drink. Justin Charles (Richmond): Suspended for 16 games from round one, 1998 after testing positive to the anabolic steroid boldenone in June 1997. 34 past and present Essendon players are awaiting a verdict in from the AFL Anti-Doping Tribunal after allegedly taking the banned drug thymosin beta-4 as part of Essendon's 2012 supplements program. Ryan Crowley (far right) sings the club song after the round 17 win over the Giants. Picture: AFL Media. Crowley was at his negating best in the comfortable 76-point win over the Giants at Patersons Stadium. Although collecting just nine disposals of his own, Crowley was among the Dockers' best players on the day he tested positive, restricting Tom Scully to just 16 touches. He was also one of only a handful of players who could hold their heads high the following week in a horrible 58-point loss against lowly St Kilda. 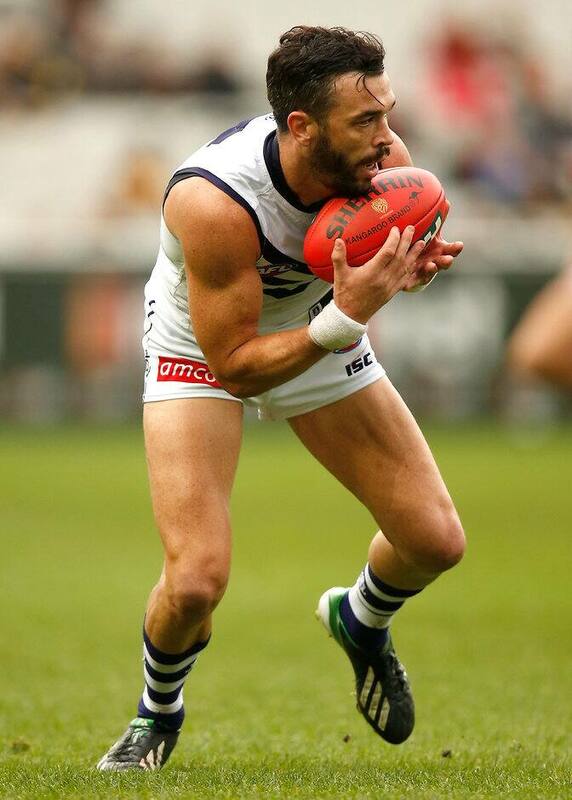 May 2014 – Geelong's Steve Johnson is suspended for one week after headbutting Crowley. June 2013 – Crowley is fined $1200 for a misconduct charge where he pinched North Melbourne's Brent Harvey "about 300 times" according to the Kangaroos veteran. April 2012 – Criticised by dual Brownlow medallist Gary Ablett on Twitter during a game against Carlton. "Crowley is a joke! Play the ball, not the man! That's why Lingy was such a great player he ran both ways! #givejuddafreekick" Ablett tweeted.